Today we will be visiting Asahikawa before continuing north east almost all the way to Abashiri on the northern coast of Hokkaido. Asahikawa is located in central Hokkaido and is the coldest major city in Japan with average high temperatures remaining below freezing during winter and a minimum temperature record of -42 degrees. The biggest attractions of the city are probably the Asahiyama Zoo and the Asahikawa Winter Festival which we timed our trip to coincide with. So, in the morning we checked out of our hotel, caught a taxi to Furano station and then a train to Asahikawa. We decided to do the zoo first as we thought the festival is more lively in the afternoon, so we were headed to the zoo first. Due to the festival, we found the station to be packed and scrambled to find lockers to store our bags. Luckily thanks to our small carry on sized suitcases we managed to secure a locker each, though we did see some Chinese tourists with huge bags who were not so lucky. After stowing our goods we made our way to the bus stop to find a huge line! Fortunately there were frequent buses and we managed to get on without waiting too long. We were also lucky to get a seat as it was quite a long journey of around half an hour out to Arashiyama. Arashiyama is a popular zoo as it has been designed to allow visitors to get close view of the animals through the use of cleverly designed enclosures and viewing locations. After arriving at around 10:30 we bought our ticket, which was much quicker if we used the vending machines, and then entered the zoo. The first animal we met was a hippo, then we saw an ostrich. After that we gathered with almost everyone else in the zoo for one of the highlights- the daily march of the penguins! We had a good viewing location and got to watch ten adult king penguins waddle along the road, they were very cute! There was also another penguin, that looked like a baby king penguin but I now know, thanks to Polar Bear Cafe, that king penguin chicks looks like an ugly puff of feathers and this little penguin is actually a Gentoo penguin. While the king penguins were pretty stoic, the little Gentoo penguin was much more curious and cute and ran around all over the place. Next we explored the rest of the zoo visiting some goats, lemurs or maybe a monkey, then birds such as owls, hawks and cranes and then reptiles such as turtles and snakes. We also saw some tanuki which are a famous animal in Japan, as well as a fox, Japanese monkeys and chimpanzees. There was also a wood pecker which really surprised me when it started rapidly and loudly pecking wood! Another highlight of the zoo is the wolf enclosure where you can view them closely using a transparent dome built into the enclosure. Though they were not too exciting today. Another exhibit was the lesser pandas which are really cute! Next up was a bear, followed by a tiger! Not only tigers though as we also saw other big cats such as lions and even a leopard. In a contrast to the polar bears I've seen in Australia, usually just lying down, the polar bears at Asahiyama were swimming and playing around a lot! One of the other big highlights of the zoo is the seal area which contains a small, water filled floor to ceiling cylinder that travels through the middle of the viewing area. Seals can swim through this which is really cool to watch! Finally, before leaving at around 1pm we also met the giraffe. After catching a bus back to Asahikawa we made our way down to the city's winter festival. The Asahikawa winter festival is the second largest in all of Japan, beaten out only by Sapporo's snow festival. The winter festival runs for about a week in early February and attracts visitors from around the world, many of whom, including ourselves, also visit the nearby Sapporo festival which occurs at the same time. Upon arriving at the festival area we had a look at a couple of snow sculptures of giant heads before making our way to the food area for lunch- we were starving! We ended up getting some chicken skewers and a pizza, though we also saw Emu, Crocodile and Kangaroo from Australia for sale- which was surprising! After lunch we went on a ride which involved being pulled around on a rubber boat by a snow mobile, it was fun! Next we walked through a snow maze and then had a look at some humongous snow sculptures. One of Ultraman was probably about 15m high. Off to the side of this sculpture was a slide you could slide down, though it sadly looked to be for kids only. On the way back to the station we walked past some ice sculptures, some which were completed though most were still currently being sculpted- which we watched. 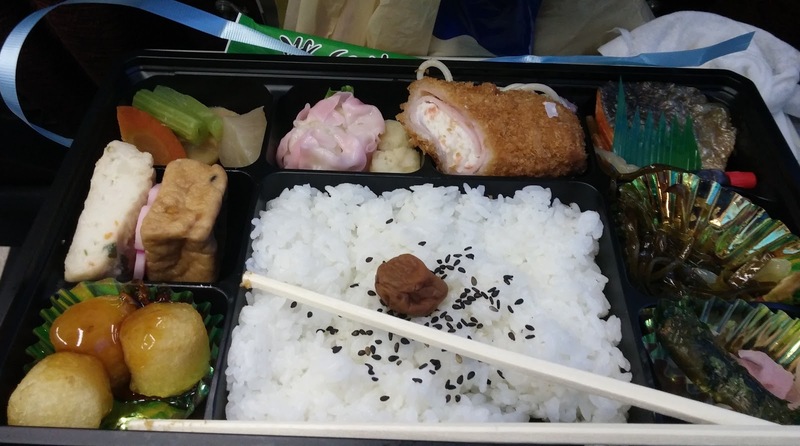 Once back at the station we grabbed some eki-ben (train lunch boxes) for our train ride, got our luggage and caught a train north to Kitami, which isn't too far from Abashiri. We also bought some delicious sable cookies with chocolate inside them from the station earlier, they were really delicious! The reason we were staying in Kitami was that all the non-smoking hotels in Abashiri were booked out! Thankfully though we found a dormy inn in Kitami for a reasonable price. Dormy inn is quite a nice hotel brand as they have onsen, free washing and free late night noodles! Tomorrow we'll be catching a train to Abashiri for an ice breaker boat to see the oceanic drift ice, as well as a visit to the northern peoples museum and the notorious Abashiri prison. Thank you for sharing this great post about Japan. May I know for your stay at Dormy Inn, is the onsen free of charge? Thank you. Thank you very for reading! Yes, it is free of charge to use the Onsen at Dormy Inn if you are staying there. This is the case for all Dormy Inns in Japan. In general, for all other hotels and ryokan in Japan if you are staying overnight there is no charge to use the onsen. At some ryokan you can also use them even if you are not staying overnight, but there is a small charge (300-100yen) for this use by non-guests.